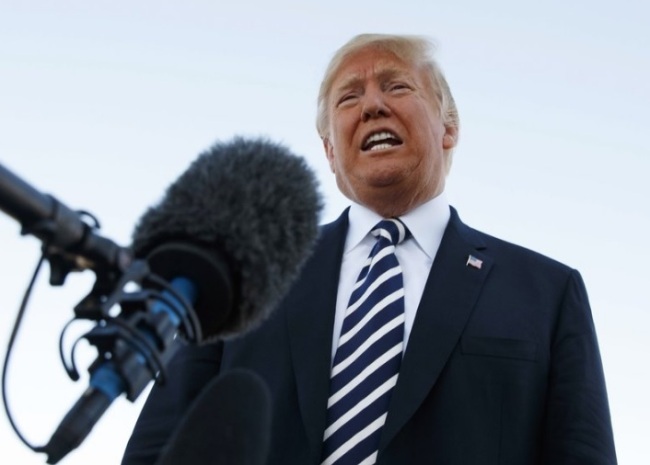 ELKO, Nevada (AP) — President Donald Trump said Saturday he will exit a landmark arms control agreement the United States signed with the former Soviet Union, saying that Russia is violating the pact and it’s preventing the US from developing new weapons. The 1987 pact, which helps protect the security of the US and its allies in Europe and the Far East, prohibits the United States and Russia from possessing, producing or test-flying a ground-launched cruise missile with a range of 300 to 3,400 miles. The agreement has constrained the US from developing new weapons, but America will begin developing them unless Russia and China agree not to possess or develop the weapons, Trump said. China is not currently party to the pact. National Security Adviser John Bolton was headed Saturday to Russia, Azerbaijan, Armenia and Georgia. His first stop is Moscow, where he’ll meet with Russian leaders, including Foreign Minister Sergei Lavrov and Security Council Secretary Nikolai Patrushev. His visit comes at a time when Moscow-Washington relations also remain frosty over the Ukrainian crisis, the war in Syria and allegations of Russian meddling in the 2016 presidential race and upcoming US midterm elections. Trump didn’t provide details about violations, but in 2017, White House national security officials said Russia had deployed a cruise missile in violation of the treaty. Earlier, the Obama administration accused the Russians of violating the pact by developing and testing a prohibited cruise missile. Russia has repeatedly denied that it has violated the treaty and has accused the United States of not being in compliance. Defense Secretary James Mattis has previously suggested that a Trump administration proposal to add a sea-launched cruise missile to America’s nuclear arsenal could provide the US with leverage to try to convince Russia to come back in line on the arms treaty. Trump’s decision could be controversial with European allies and others who see value in the treaty, said Steven Pifer, a former US ambassador to Ukraine and now a senior fellow at the Brookings Institution who focuses on nuclear arms control. US officials have previously alleged that Russia violated the treaty by deliberately deploying a land-based cruise missile in order to pose a threat to NATO. Russia has claimed that US missile defenses violate the pact.